G Wiv wrote: Going to run a special of lamb ribs tonight at Barn & Co, thought some may be interested. Picture = 1000 words. Two pictures, 2000 words. 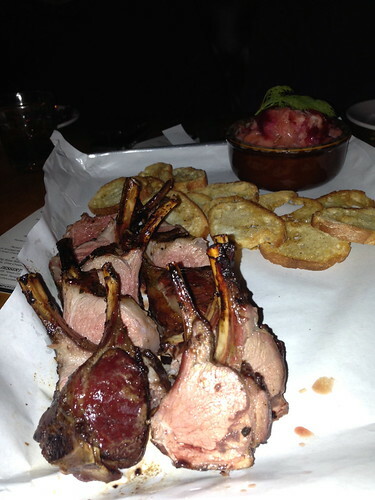 Lamb ribs, Barn & Company. Going to run a special of beef ribs tonight, Thursday, at Barn & Co, thought some may be interested. I was at Barn & Co. last night and I got to try a sample of the beef ribs. I'm sure Barn will be swamped tonight for the Bears game, but it's worth making a trip for these ribs if you're so inclined! oh man, I so wish I hadn't been out of town for this, Mrs Sweet Willie & I adore lamb BBQ. Please make sure to keep board up to speed if you run another lamb item !! Thanks ! Lamb rib special again Thursday 9/20/12. Nice to see a few LTHers last time out. Will try to make it by my little lamb. G Wiv wrote: Lamb rib special again Thursday 9/20/12. EXCELLENT ! See you tomorrow early. So yesterday I had the lamb ribs. Sooooo good, smokey lamb goodness w/a sweet/heat rub, no sauce was required at all. Chicken wings as a starter were quite tasty, again smokey (sensing a theme? ), yet crisped up from a slight time in the fryer. Oh I missed this! I love barbecue lamb ribs - I have ordered them from Jack Stack in Kansas City and try to get them whenever I can here in Chicago. Were these Denver racks? When will they be available again? ld111134 wrote: Were these Denver racks? When will they be available again? Yes, Denver style. We are alternating Thursdays with lamb and beef ribs. We will have lamb ribs again on Thursday 10/4. 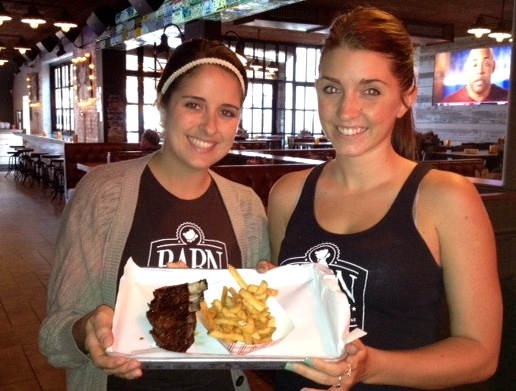 In addition to the lamb and beef rib specials Barn & Co always has all you can eat baby back ribs on Thursdays for $14.95 with fries. Thanks, Gary. I am also a huge fan of Texas-style beef ribs, so this is a home run for me. Stopped in for some lamb ribs and a sampler platter the other pm. Before SteveZ and Gary had shown me that brisket didn't have to remain a painful memory from my mother's repetoire (place in casserole, add dry onion soup mix + cup of water and bake until hard) i'd gone 4 decades w/o eating any. The brisket and smoked chicken were right on the $. The hot link had a great snap and was seasoned to my liking i.e spicy and sageless, but I had an issue w/the texture inside, which I found to be mushy. The slaw needed a bit of help as well but the lamb ribs really worked. Excellent bark, juicy w/just the right amount of fat and chew resistance but the rub was mild by Gwiv standards. What's up w/that Gary, you going delicate on us? Cooking for the great unwashed causing you to rub your rub less? Jazzfood wrote: The hot link had a great snap and was seasoned to my liking i.e spicy and sageless, but I had an issue w/the texture inside, which I found to be mushy. Link was a Mikeska jalapeno and cheddar cheese sausage, I'd guess it was the cheese you found mushy. Rub wise, with lamb ribs I've been running a little sweet with my heat, lamb ribs were rubbed lightly with brown sugar then a fairly spicy rub. I thought the combo worked particularly well with the rich flavored lamb ribs. Glad you and T enjoyed the meal, always nice to have you in. Got some Goose Pastrami love from Chuck Sudo on Chicagoist. Chuck was kind enough to collaborate on the Goose breast pastrami for toady's, 11/28/12, Pitmaster Dinner at Barn & Co. I've been remiss in not writing about how much I enjoy GWiv's Pitmaster Dinners. I'm looking forward to tonight's and eager to try the goose pastrami*. This will be my third Pitmaster Dinner [having previously enjoyed the Texas and Carolina iterations]. I fondly refer to them as my favorite 'value meals' . Abundant cocktails & Wiv-sized portions of well-smoked, well-prepared, well-thought-out food. And for $40. Seriously, if you haven't been to one of these yet you have to give it a try. had a dinner for 6 last night at Barn & Co as the Thursday that lamb ribs are served. Jazzfood wrote: .... but the rub was mild by Gwiv standards. 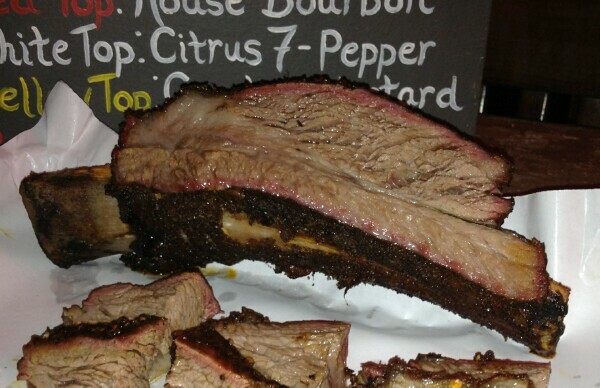 Still moist & tasty, glad we got ours before they sold out, we will be back as our group would like to try the beef ribs. We went for the first time on Saturday before theater down the block. We got there pretty early, so there was no wait. The pulled pork and chicken were quite good, and the sauces were all tasty. The chicken has a spicy kick to it - unexpected, but really good. DH says so far it's been his favorite BBQ chicken in Chicago - moist and flavorful. Fries were only OK. The beer selection was fine, but I really don't like drinking out of mason jars. What's wrong with normal pint glasses? They also need sharper/pointier knives. we had a tough time using a butter knife on the chicken. I found the Yelp reviews amusing (the majority say "the brisket is too fatty") but wonder if having uninformed customers might be leading to those reviews. They might want to put a meat cut definition section on the menu. That sounds like a favorable thing to say in a review to me, as in, "the brisket is too fatty to not order each and every time." leek wrote: They also need sharper/pointier knives. we had a tough time using a butter knife on the chicken. I just attended the Templeton dinner and they had sharp knives with the silverware, so they have them if you ask. Speaking of the Templeton dinner, I've been meaning to post a couple of pics, so here they are. We started with belly three ways, lamb, beef and pork. 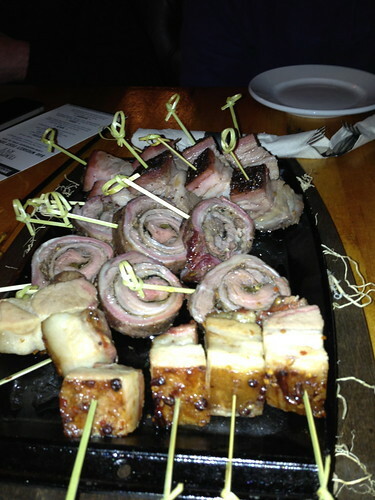 The lamb was rubbed with toasted cumin, the beef with szechuan pepper and the pork with ma la oil. They were each wonderfully flavorful and fatty (take that Yelp reviewer). I've come to love lamb bacon from Smoking Goose so I adored the belly here. Next was soft smoked rack of lamb with black garlic butter, they were like eating prime rib, it just kind of melted off the bone as I ate them. The smoke flavor was subtle, it enhanced the meat, but it wasn't the predominant flavor. I usually wind up eating half of everything at these dinners because there's so much food and taking the rest home, but not for this dish. The dish at the back of the plate is a gravlax with beet juice served with smoked pig butter and toast, that I did take home and enjoyed for breakfast the next morning. The beet juice added color to the salmon which had a buttery texture. We also had a ramp and smoked pig bone risotto and roasted beets with goat cheese and candied pistachios. 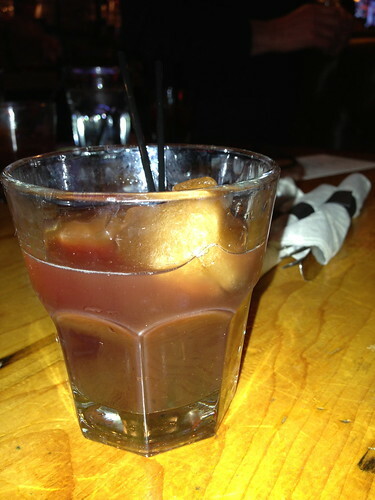 My favorite drink was a Smoking Barn that combined Templeton with Cherry Heereing, lemon and smoked ice. I couldn't figure out where the smoke flavor was coming from in the drink, it turned out they paired with Rare Tea Cellars to use a Lapsang Souchong tea for the ice. It was wonderful, deeply smokey complimenting the rye and cherry flavors. I'd love to try and duplicate this at home. I really like these dinners, its great to have creative takes on bbq that I can't do myself. Stopped by last night, completely unaware of any specials. Happily learned that there was an all-you-can-eat special on pork (baby back) ($15) and beef+pork ($17) ribs. We ordered the fried pickles, a 1/2 chicken and 2 specials (one pork, one beef+pork). My most recent comparison of fried pickles is against Lillie's Q, and these are significantly different. Smaller, denser, more compact - like comparing landjaeger to fresh kielbasa. Intensely salty and with a crust that seemed more crumb-y than batter-like, the basket was polished off in short order with a Purple Haze. I ended up preferring these to Lillie's due to the pickle texture and batter. Switching gears, the waitress brought out some Shiner Bock. The ribs came along at a more leisurely pace. Recalling the old Lessons, I was a bit surprised to see a glaze on the rack which added sweetness in the same beneficial way that a racing wing adds HP to a Civic . Regardless, they were quickly rendered meatless. Hickory dominated the smoke flavors, but there was an underlying mellowness that I guessed as apple or peach. GWiv was in the house on this particular evening and graciously stopped by for a chat, confirming that the wood was indeed a mix with the hickory in majority. After hearing my reaction to the glaze, he offered up the next rack sans glaze and with some fresh rub sprinkled on top. What a difference! The same rub that had been tamed in the first rack stood up with much more assertiveness. Both my dining companion and I agreed that this prep was the winner. I recently had the chance to visit Pappy's Smokehouse in St. Louis, and was happy to compare their baby back ribs against Barn & Co.
- slightly larger loin muscle and bones. seems bigger/meatier. - slightly smaller bones. seems smaller/leaner. - spicier (yay!) without sauce. - more chew. more work. Having cut my teeth on the Lessons a few years ago, the 2nd rack of Barn & Co. ribs put a big, pork-fatty smile on my face. Both Pappy's and B&Co. were excellent in their own way, but it sure is nice to have this place closer to home. At this time we realized that the 1/2 chicken had been sitting on the tray, looking forlorn and neglected. I ripped a drumstick off and tucked in. Again, the sauce seemed to work against me - it was hard to identify the smoke or seasoning flavors, but the bird was well cooked and juicy nonetheless. Next time, I'm going to ask for sauce on the side. A few Bocks and bones later, we packed up and wobbled out into the cool, breezy night. I'll definitely be back to sample the links and pulled pork. We did this once before and everyone had a good time, including me. Its 9 consecutive Tuesdays starting September 17th from 7pm-9pm and the last series sold out fairly quickly. "At each event, pitmaster Gary Wiviott leads a barbecuing lesson, during which participants make an 8-ounce bottle of barbecue sauce to take home. A family-style meal—complete with six bourbon samples from maker Heaven Hill Distillery—complements the lesson, chock full of barbecue classics including pulled pork, slow smoked baby back ribs, brisket tacos, and smoked wings. Cornbread, coleslaw, and other sides round out the meal, which closes with pecan pie. A representative of Heaven Hill will be on-hand to give a short talk on the evolution of American whiskey." Gary, are you still doing lamb ribs every other Thursday? If so, what will the dates be for lamb ribs in September? (I'm planning another dinner). Sweet Willie wrote: If so, what will the dates be for lamb ribs in September? (I'm planning another dinner). As you know every Thursday at Barn & Company we have all you care to eat low slow smoked pork ribs for $14.95. 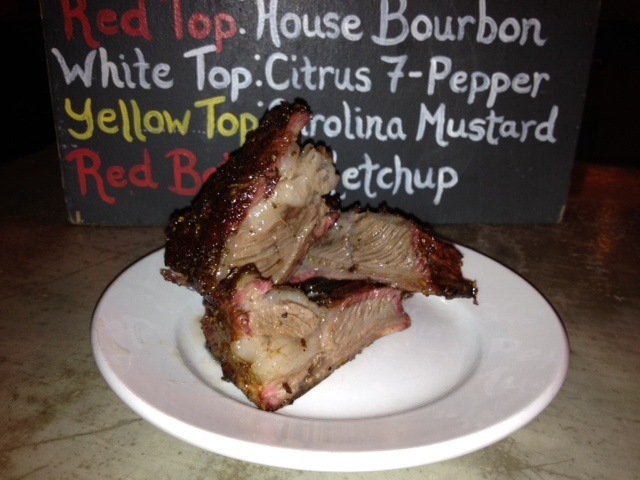 In addition to ayce pork ribs we alternate between all you care to eat low slow smoked lamb and beef ribs. This Thursday, August 15th, will be ayce pork and lamb ribs. Barn & Company low slow smoked pork and lamb rib dates in September are 9/12 and 9/26. Teresa and I had the pleasure of trying Barn & Company for the first time last week. I wasn't avoiding the place, honestly I rarely if ever eat BBQ out since I smoke and grill so much at home. We went in on a Thursday and tried a bit of everything, all of which was delicious. I took home a lot of leftovers which didn't stay in the fridge very long. The major standout of the meal was definitely the brisket. It was absolutely terrific, the best I've had! As most people here have said, it was really moist, just the right amount of smoke and had a pleasant chew to it. The best adjective I can come up with is clean. As weird as it sounds, with the added Jus, the soft clean bits of fat, and the chew to the texture, it reminded us both of eating prime rib. Absolutely delicious, I can't wait to get back for more. Barn & Company, Count me a fan! Saw a sign there saying new management....whats the scoop ? bnl wrote: Saw a sign there saying new management....whats the scoop ? New owners, same Pitmaster doing low slow BBQ. Increased emphasis on service, presentation and customer interaction. Wider range of salads, burgers and desserts, eight types of smoked wings, which are fantastic, and expanded craft beer and cocktails. Core BBQ items remain the same, though we added hickory smoked beef ribs to the permanent menu and moved all you can eat rib night to Mondays. All changes have been extremely positive with everyone involved, especially myself, newly energized. 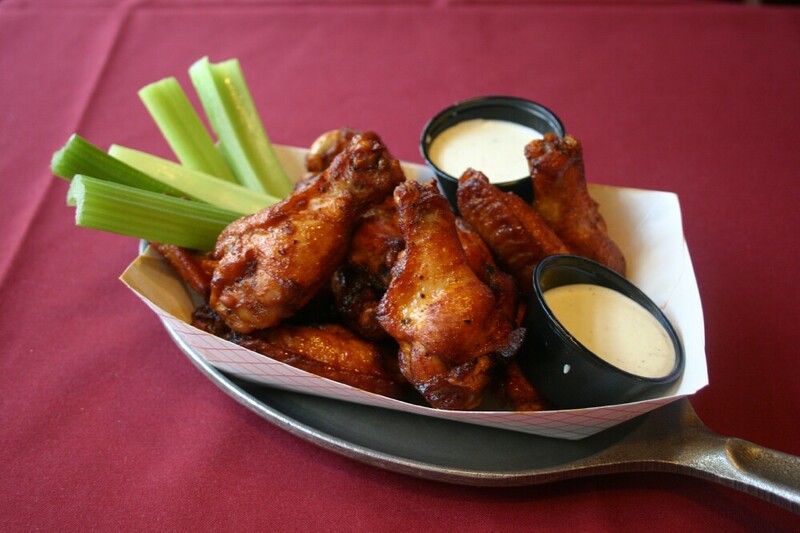 Barn & Company will be featured on Chicago's Best TV tonight, Sunday, at 10pm for our SmoFried chicken wings. The show will play throughout the week on both WGN and CLTV. Brittney Payton is as nice in person as she is pretty. G Wiv wrote: Barn & Company will be featured on Chicago's Best TV tonight, Sunday, at 10pm for our SmoFried chicken wings.